We woke up fairly early. I love this about vacations. The jet lag helps us get up very early and feels like we have so much time during the day! We showered and had breakfast in the room from the provisions we bought the previous night: Cheese sandwiches, coffee and biscuits. We were ready to head to Caesarea! 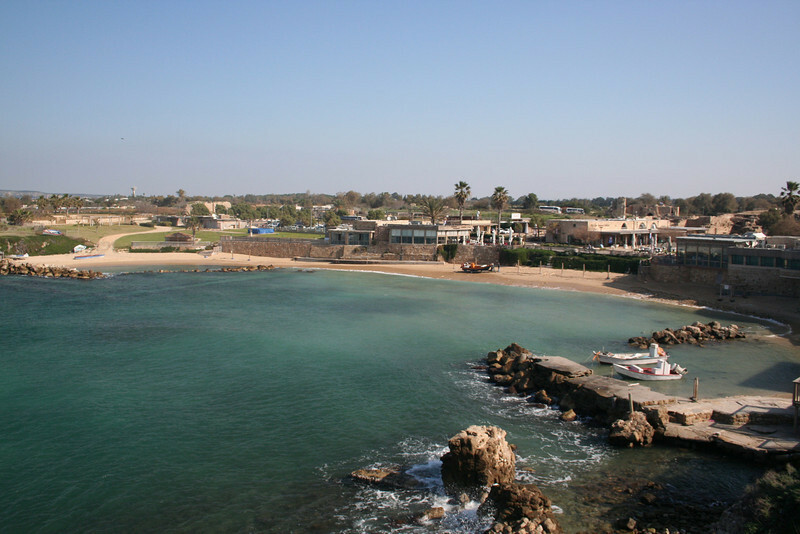 Caesarea was a thriving port city since Roman times. We took a cab from our hotel to the HaHagana train station. The cab driver was talking on the radio (in Hebrew) and I simply love the sound of the language as much as I love listening to Arabic. At the train station, we were asked at the security checkpoint on our destination and I said Caesarea (like: See-za-ree-yaa) and the security personnel got confused and would not let us through. I was taken aback – was the place restricted? Did we not plan right? Eventually I found a train map around and pointed Caesarea to him and he said … “Aaah! Qasariya” (like: Kay-saa-ree-yaa). Is it that different? Oh well. At least we did not miss our train! The train was largely filled with soldiers either going home or to their base, businessmen and Haredim. We got some excellent Lavazza coffee while we waited. Coffee outside of the US is universally good. A lot I think is to do with the way people partake beverages: Coffee in the US feels hurried and for the caffeine kick. The taste is burnt to me and not bitter. Most other places it is to savor and enjoy the quiet time. We also loved the way the station announcements were made: Hertziliya, Hadera, Netanya, Quesariya – it sounded so lovely. We still try to say it that way with each other. It is interesting how such tidbits bring back memories of the entire trip. Each time either of us tries to imitate the names, we end up recounting the things we loved in the trip. We arrived at the Quasariya train station at around 10:30 AM. It seems the only way to get from the train station to the Caesarea ruins was a taxi. Our driver did not speak english so it was impossible to ask him how to get a cab back. But then, how hard could that be? Right??? It turns out that there are two Caesareas: The ruin itself and the city of Caesarea, a private rich township. 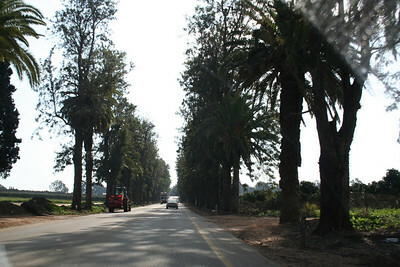 The drive to the ruins were through orchards. We arrived at the ruins and for a place that was touted as one of the most awesome and famous, it seemed quite empty. We got our tickets and entered the park. The entrance is called the crusaders entrance which gave the impression that the buildings are fully preserved. After entering we proceeded to the visitors center. There were a few exhibits from Caesarea’s past and a video on how Caesarea was built. 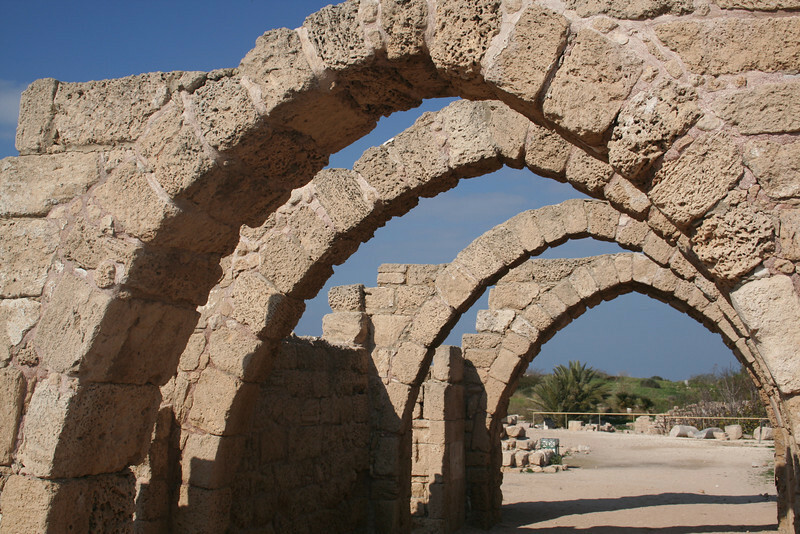 I was amazed at the engineering feats accomplished more than 2000 years ago and how important Caesarea was for the various kingdoms that ruled this land. Part of Caesarea that used to be the city, now submerged. 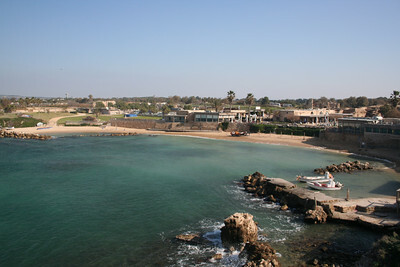 From the visitors center we could see a part of Caesarea that had been reclaimed over 2000 years ago. Today the sea has reclaimed the land and all we see are remnants of a bygone era… Gorgeous views! We returned to the entrance to start the tour of the park and spent the rest of the day walking around the ruins. Some notes are here. The most fascinating thing about Caesarea was that most of the city was reclaimed land, which you cannot see today, the sea has taken over. However, the ruins remain. We entered the city through the lovely arcade. We walked along the western and southern side. Right next to the arcade we saw pieces of marble pillars lying around. Ruins can be so deceptive and half the fun is using your imagination to build the grandeur of the cities that once stood and thrived. 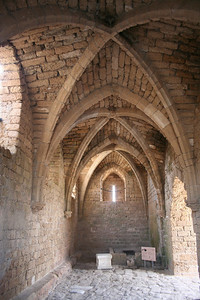 The arcade is a testimony to how grand Caesarea must have been at its prime. Its importance and prosperity also showed in the ruins of important rich merchants, the many government official mansions, plenty of taverns and large bathhouses. We stopped by lunch a restaurant (more like a diner) and ordered sandwiches. The owner seemed to be American and so we talked to him. He was from Sacramento. He seemed excited that we were from San Francisco and was talking to us quite happily… until… another American couple (Caucasian) came into the restaurant and he was just so delighted to see them and they were from Arizona, a pretty big distance from the bay area! He then completely ignored us, even when we were leaving. This was one of the few times in life I’ve actually felt color and race matter much more than I wish they would. It left a very bitter taste in my mouth. We then walked around the western and southern wall of the city and noticed that there were a lot of fortifications for the city. Large columns lying on the floor meant that there must have been rich merchants/political figures with homes in the city. We also passed a building that must have been the “tax archive” further showing the significance of the city. At the end of the city was the hippodrome where there used to be horse and chariot races. Behind the hippodrome was a large roman-style amphitheater which is still in use today for musical performances. Of course, I climbed to the top! We walked back to the entrance and this is where our woes started. There was almost no way to get a taxi back to the train station. We waited and waited for almost an hour! Finally we went back to where the restaurants/shops were (which were just opening for the evening) and used the phone at a shop to call a cab. We shared the cab with a young guy, Marcus, who had emigrated from Australia to Israel and was figuring his way out in life (his words, not mine): He was learning Hebrew, Judaism and worked at a tech call center to pay the bills. On the way back in the train the crowd was much more diverse than the morning: IDF Soldiers, businessmen, people in suits, youngsters/hipsters, Haredim, Christian priests and nuns, families (with kids who would not stop talking), school children and, of course, tourists like us. We were really hungry when we got back to Tel Aviv. Our destination for dinner that night was Thai House. After the long day of walking, so-so lunch and extreme frustration waiting for a cab at Caesarea, it just seemed right to get downright comfort food (yes, Thai is comfort food for us). We got a green curry, pad-thai, vegetarian rolls and they all hit the spot! Tired, we head back to the room to get some sleep! It was a long day, and despite some drawbacks we were very happy.